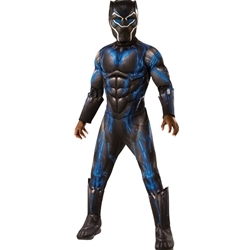 The Black Panther Battle Suit Kids Costume includes Muscle Chest Jumpsuit with Shoe Covers, and Mask. This costume is available in Kids’ Size Small, Medium, or Large. Channel the power of the Panther Ancestry with the Black Panther Battle Suit! Flowing with energy, this vibranium inspired suit puts you in the role of the Marvel super hero Black Panther. Suit up with Black Panther Kids Mask and Black Panther Kids Gloves to take on the forces of evil this Halloween!